Charming contemporary villa situated in a quiet cul de sac just 1.2km (you can walk it) from the pebble beach at Antibes. Shops and restaurants 900 metres. 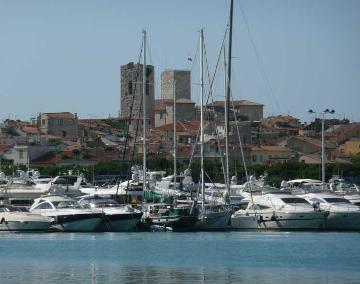 The sandy beach is within easy driving distance as is the centre of Antibes. You can stay here without a car as there is a bus stop 900 metres from the house with a frequent service. The upper floor has two double bedrooms (1 x 160cm wide beds in each). Bathroom with toilet. Further double bedroom (1 x 160cm wide bed) which can be transformed into a twin (2 x 90cm wide beds on request at the time of booking). Separate toilet. One of the upper floor bedrooms has a television. The ground floor has a spacious, L-shaped living and dining room with fireplace and a huge television. The kitchen is modern, light and well equipped, it also has a television, breakfast table and convenient direct access to the covered terrace which is partly shaded by a plane tree. Double bedroom (1 x 160cm wide bed) with dressing and en-suite bathroom (which can also be accessed separately from the living room area). Separate toilet. There is air conditioning just in the four bedrooms, there are hair dryers in each bathroom and mosquito blinds on the windows. The house is well suited to a multi-generation family with the ground floor bedroom nicely separated from the rest by a well-insulated door. The enclosed, well kept and attractive garden is very well suited to children as there is a good sized lawned area as well as a super round pool. Children also enjoy the trampoline and slide. The garden is largely screened by mature trees and bushes so there is reasonable privacy. There is plenty of parking space on the grounds including one covered space. The interior is in perfect order and the decor is homely and a little exotic. The house enjoys plenty of sunshine is nice and light and airy whilst being well equipped to provide a cool living environment if required. The main covered terrace which is accessible from the kitchen and living room faces the rear of the next door neighbours property so there is practically no interference from next door. This is an ideal spot for eating outdoors, relaxing or preparing a barbecue and the views of the valley are very pleasant. The discrete and friendly key-holder (who speaks English) lives nearby and is on hand to assist if required to arrange hiring boats or guided walks in the hills or for useful suggestions. The walk down to the local shops and restaurants is very doable along what is a minor road although there is a bit of gentle uphill to negotiate on the return. Here you can enjoy a relaxing holiday with friends, if you have children there is plenty for them to do in a nice safe environment. The neighbourhood is nice and peaceful and there is no noise from aircraft which can be a problem in some residential parts of Antibes. Antibes itself is a lovely historic port with lots of atmosphere, a charming covered market and an outstanding choice of bars and restaurants as well as many interesting shops. There is a huge hypermarket just five minutes drive from the villa and there is easy access to the duel carriageway which leads to the hills inland as well as the perfume city of Grasse. Property made available in good order and fully equipped. Linen and towels (not beach towels) provided. Local taxes, reasonable consumption of services including water, gas and electricity. Garden and swimming pool maintenance. Three hours cleaning provided each Wednesday. Refundable deposit payable locally in cash 500€. Heating for the house and firewood. Additional services (where available) including cleaning, babysitting and cook.